As I read through his memoir, Sinner's Creed, I was impressed with his openness as he discussed the roller coaster aspects of his life. Stapp's memoir chronicles his journey, beginning in childhood. With amazing candidness, he talks about the things that helped mold and shape his faith and world view - including a step-father who both introduced him to a faith in Jesus, but also abused him physically and mentally. Then, without going into graphic detail, Stapp lays out the things that impacted him - and expanded on how someone from a fundamentalist background could find himself pouring out his soul into rock lyrics. Stapp is also blunt as he describes the rise and downfall of Creed - and the good and bad aspects of his lifestyle - and how his choices (along with those of his bandmates) played a role in it. If there's one thing that truly impressed me, is how Stapp only went into graphic detail only when necessary for the storyline. He did not "point fingers" or write a "slash and burn" memoir like some have released in the last few years. Instead he wrote a true, honest account of his life. While the memoir is graphic, it is not gratuitous in nature. I think I could hand this book to anyone - high school through adult - who might be facing similar struggles. I'll be honest. I identified with Stapp in many ways. I also found myself walking down memory lane as he talked about the background of many of his lyrics. I even pulled up iTunes, so I could sample songs as I read. I remember several of the songs well - they were either introduced to me by high school students in one of my early youth ministries - or were staples in the newsroom (my guess - the latter). Reading the lyrics with "20/20 hindsight" (and the help with his account), I continue to be amazed at the way Stapp struggled with his faith through his words. Maybe it's because I'm a "wordy" person. Maybe it's because, again, I identify with a few of his experiences. All I know is I picked this memoir up simply because I love the genre - and was ready for a non-fiction read. What I found, is a book that challenged me, made me think and honestly, left me wondering how God was using Stapp's words to minister to me - a simple children's pastor/writer in Arkansas. On the scale of one to five, I give this book a solid three and half to four. I think if you like memoirs, or the music of Creed/Scott Stapp, you'll truly find this book to be interesting. I also think this book will speak to people struggling through their faith journey. In my case, it left me wanting to purchase some of his past works - and left me looking forward to following his music in the future. I'm grateful he wrote about his life - because it helped me re-examine my own life in an interesting way. 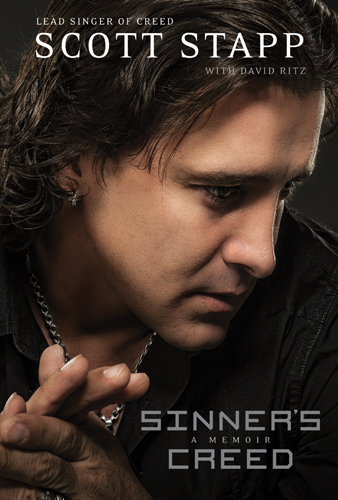 Scott Stapp is among the most successful artists of the modern rock era. As Creed's lead vocalist, he has sold over 35 million records, with 26 million sold in the United States alone. He has toured the world several times, selling out arenas and major stadiums. His song, "With Arms Wide Open" won a Grammy as Best Rock Song of 2000. One Rolling Stone writer has called Stapp "one of the most influential and boldest rock writer/performers of the past 25 years whose fans must be counted in the legions." In 2000, Stapp founded the With Arms Wide Open Foundation, a charity organization dedicated to "promoting healthy, loving relationships between children and their families." In early 2010, Stapp flew to Haiti to help the victims of the 2010 Haiti earthquake.His first solo album, The Great Divide, has already been certified Double Platinum (2 million+ sales), and he is in the process of recording a second album, due out in 2012. Scott lives in Florida with his wife Jacyln (Miss New York USA of 2004 and Mrs. Florida America of 2008), and their three young children. David Ritz has written books with Ray Charles, Marvin Gaye, Aretha Franklin, B. B. King, and many others. David is a born-again Christian, and his book on black Christianity, Messengers, was called "inspirational and deeply moving" by Time magazine. He has won a Grammy for liner notes and is the only four-time winner of the Gleason Music Book of the Year Award. Ritz lives in Los Angeles with Roberta, his wife of forty-two years. Note: As a freelance journalist, I was provided a copy of this book by the publisher. This review was not influenced by a free book - just in case you (or the FTC) were worried about this detail.